An informed look at the myths and fears surrounding nuclear energy, and a practical, politically realistic solution to global warming and our energy needs. 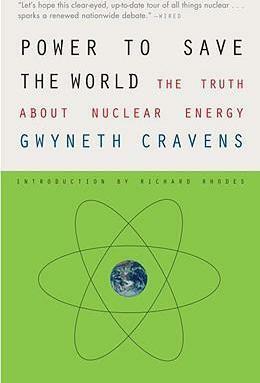 Faced by the world's oil shortages and curious about alternative energy sources, Gwyneth Cravens skeptically sets out to find the truth about nuclear energy. Her conclusion: it is a totally viable and practical solution to global warming. In the end, we see that if we are to care for subsequent generations, embracing nuclear energy is an ethical imperative. "Let's hope this clear-eyed, up-to-date tour of all things nuclear. . . . Sparks a renewed nationwide debate." --Wired "Provocative. . . . A fresh look at nuclear power [that asks] whether the threat of global warming has changed the calculus of nuclear risk." --The Washington Post Book World "Illuminating. . . . A picaresque, flat-out love song to the bad boy of the great American energy debate." --The Wall Street Journal "Engaging and unusual." Gwyneth Cravens has written about science and public health for The New York Times, Harper's, and The Washington Post. She was an editor at The New Yorker and at Harper's, and has published three novels: The Black Death, Heart's Desire, and Love and Work. This is her first work of nonfiction.